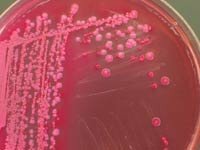 A dangerous drug-resistant bacterium has reached Southern California healthcare facilities, according to a study released Thursday by Los Angeles County public health officials. Researchers found 356 cases of carbapenem-resistant Klebsiella pneumoniae, or CRKP, at healthcare facilities in Los Angeles County, mostly among elderly patients, said author Dr. Dawn Terashita, a medical epidemiologist with the county Department of Public Health. "We think that this is increasing," Dr. Jonathan E. Fielding, the county's public health chief, said of the infections. The county health department required facilities to report the infections starting June 1, 2010, and Terashita analyzed reports through Dec. 31, 2010, filed by 52 hospitals and a regional lab. She found 146 infections at eight long-term acute-care hospitals, including an outbreak at one hospital, she said. Another 20 cases were reported at nursing homes and the remainder at short-term acute-care hospitals. Fielding did not identify the facilities. County-run healthcare facilities had two patients test positive for CRKP this year and 20 last year. Although the latest CRKP outbreak is limited to hospitals and nursing homes in Southern California, infections from drug-resistant bacteria are a major concern across the country. However, experts say patients should not avoid hospitals if they need treatment. The mean age of patients who tested positive in Terashita's study was 73, and more than half were female, she said. She did not study how many died or the source of their infections, although she said 38% were admitted to hospitals from nursing homes. "We don't know did the patient acquire it in the hospital or did they acquire it in the nursing home before they were admitted," Terashita said. Unlike other superbugs such as methicillin-resistant Staphyococcus aureus (MRSA), CRKP is an enterobacterium, a relative of E. coli, resistant to most antibiotics other than colistin, a drug so powerful it can cause kidney damage. Studies in the U.S. and Israel have shown that about 40% of infected patients die. "These are very serious infections, hugely complicated by the fact that the treatment options are severely limited," said Dr. Arjun Srinivasan of the Centers for Disease Control and Prevention in Atlanta, which has yet to require reporting or tracking of the infections. Jim Lott, executive vice president of the Hospital Assn. of Southern California, said hospitals have contained similar drug-resistant bacteria and he was not concerned that CRKP could spread within or outside healthcare facilities. But patient advocates said they wanted assurances that hospital officials will do more to stop the spread of CRKP and other virulent bacteria. "You want to be sure there is a strategy in place to contain it so it doesn't get into the community," said Lisa McGiffert, manager of the Texas-based nonprofit Safe Patient Project at Consumers Union.